Faculty: Lily Tseng | Tuition: $435 | Register Now! 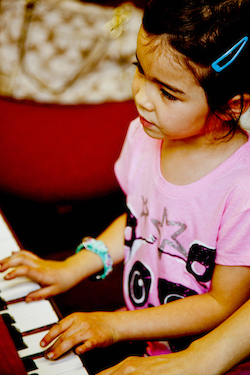 Our classes introduce a solid foundation of keyboard and music skills, including note-reading, ear-training, and ensemble playing while having lots of fun! Children learn in a small group setting with a maximum of five students in the class. A piano or 61-note keyboard is required for home practice. Faculty: Tyler Cotner | Tuition: $435 | Register Now! Please check with the NSM office for information about future sessions of this class. In this beginner course, students will learn the basic strumming patterns and techniques to play the ukulele! Students will learn the appropriate hand and instrument placement for playing chords and strumming patterns. 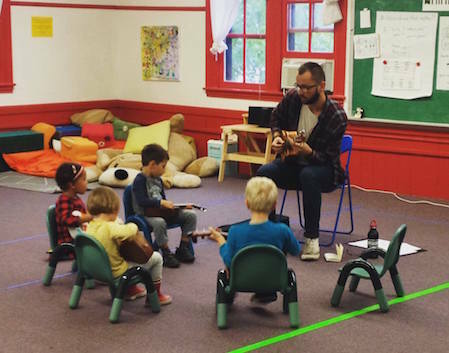 By the end of this course, students will be able to perform four to six songs, play five different chords and will have increased their rhythmic and pitch recognition leading them well on their way to becoming a rock star ukulele player! A Ukulele is required for this course. Please contact us if you need any recommendations. Parents are welcome to stay in the class but not required. Faculty: Loren Pearson | Tuition: $435 | Register Now! Faculty: Elise Tally | Tuition: $435 | Register now! 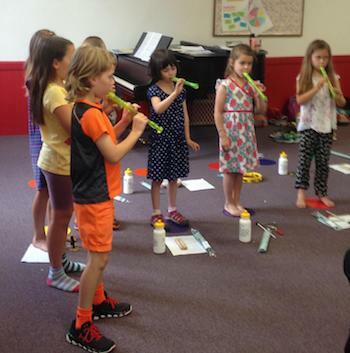 This class introduces students to the woodwind instrument family beginning with the recorder. Weekly classes will focus on building fundamental musical skills including note-reading, listening, and ensemble playing through fun activities and songs using the recorder. Each week will also introduce additional instruments from the woodwind family giving students an opportunity to try out the flute, clarinet, and variations on these instruments from around the world! All listings for adult classes can be found on our Adult Classes page! For information on additional group music-making opportunities for students ages 5-18, please visit our Ensembles page.